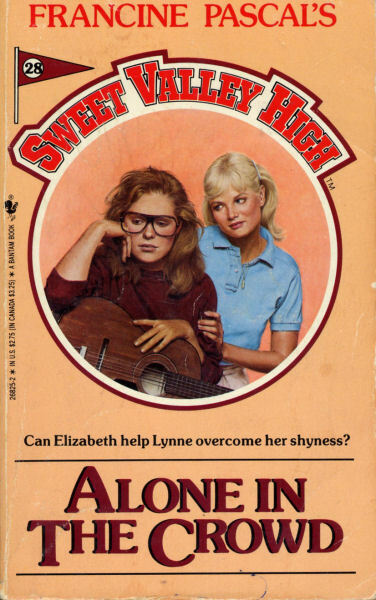 Lynne Henry is Sweet Valley High’s biggest outcast. She doesn’t talk to anyone and walks through the halls like a zombie. Her life pretty much blows, even though she’s got a good mom who’s trying to reach out to her and a comfortable home. The only time she feels any pleasure is when she’s playing her guitar and composing songs, so when The Droids announce a star-search contest for a great new song, she feels compelled to submit one. She writes it as she thinks about lead guitarist Guy Chesney, and she cries. Lynne’s self-esteem is so shot that she submits the song anonymously. When it comes time for the band to listen to the song, everyone agrees that it’s the best they’ve heard. Lynne has some serious talent, but she still doesn’t want to come forward as the author. When Liz accidentally discovers that Lynne wrote the song when she hears her singing during a guitar lesson, she feels torn about what to do. Apparently, Guy has fallen in love with the singer of the song. Through some contrived plotting and the repetition of the name Linda Ronstadt, Guy figures out that Lynne is the author and creates a flyer with a police sketch of the “mystery” songwriter. While he’s busy doing this, Lynne’s mom helps her with a makeover that turns her from a “zero” into a total hottie. Guy distributes the flyer around the school and everyone congratulates Lynne, who realizes then that Guy is totes in love with her. They make out. The B-Plot involves Jessica organizing a fundraiser for new cheerleader uniforms. She comes up with the idea that they’ll have a rocking chair relay, which I thought meant they would figure out how to race around in rocking chairs but actually means that the cheerleaders will take turns rocking in a chair for hours at a time. THAT IS LAME. To counteract the lameness of the event, she also decides there will be a dance in the gym during the relay. It is a rocking success (oh I see what you did there) and the cheerleaders get their new uniforms. I can’t help but feel that this book was written very quickly, as there are numerous glaring typos and the character of Enid seems more like a Jessica than an Elizabeth. Lynne teaches music classes at a place called the Music Center. In the interest of full disclosure, I struggle through many of the books that focus on tertiary characters instead of the Wakefield twins. As a child, I only really loved (and re-read) the ones that were all about Elizabeth and Jessica. It’s hard for me, even now, to read these titles about characters who pop out of the woodwork only to disappear again, and try to care. But I will say that Lynne’s obvious depression is alarming, especially because the word “depression” is never mentioned. Throughout the book, the reader is inundated with examples of Lynne’s depression. She’s an insomniac who has trouble getting up in the morning, she wears clothing that helps her become invisible and hides her body. She takes no care with her appearance. Multiple times throughout the story, she looks in the mirror and tells herself she’s “too ugly to be human” and a “total zero.” It’s disturbing, heartbreaking, and uncomfortable. All of this, of course, is solved in true Sweet Valley fashion: 1.) she gets a makeover–loses the glasses, puts some makeup on and some clothes that fit, and she’s pretty; and 2.) a boy notices her and suddenly she has self-worth. At one point, Elizabeth sees her laughing and talking to Guy and thinks, “she’s almost actually pretty” which is so condescending that it makes me want to punch Elizabeth in the uterus. But Lynne’s psychological issues cannot be solved by these things, and it makes me wonder what kind of message it sends to young readers. Wow, so awesome to find a site like this! I’m Australian, 22-years-old, and I have a handful of SVH and SVU books that were given to me several years ago. I’ve only read a few of them. I picked up this one as it sounded interesting and I prefer reading about other characters rather than Jessica and Liz (contrary to what you personally prefer!!). Anyway, I finished this in a couple of hours. I did like it, but like you I had some issues about it. I thought the topic of ‘depression’ was interesting. It was definitely heartbreaking, I almost wanted to cry cause I felt for her. I could relate in the sense that I have glasses, and I did have braces at one point in my life, and I used to be a painfully shy person. Anyway, what annoyed me was that she needed to change her appearance, everything, in order to get noticed. I thought that was stupid. I mean I can understand the whole “look after yourself thing” but yeah, it’s like people only want to be friends with good-looking people and that’s sending wrong messages to young girls. I hate that they removed her glasses. I’ve always had glasses (I dislike contacts for various reasons) and it annoys me when books send out the message that they’re ugly or ‘nerdy’ and therefore uncool. What I DID like was the Guy Chesney character. He actually seemed interested in Lynne BEFORE her ‘transformation’. I think he did like her, but her confidence was letting her down. So even though at the end she became somewhat of a swan, it was actually her confidence that had grown, which made her more attractive to Guy. However, you’re right – you don’t come out of depression like that so easily. And nor do you always score the guy!!! That’s one of the most unrealistic things about the entire series. And I, like you, hated the ‘almost pretty’ line, and of course snobby Lila Fowler’s comments about Lynne. I want to punch HER in the uterus haha!! Thanks for such an insightful, thoughtful comment! SVH (and all the different spin-offs) definitely have issues with looks and a direct correlation to self-worth and popularity. The fact that these books put such an emphasis on looks has always, always bothered me. Doesn’t stop me from reading them, though.